There are certain objects in the house that people rely on but hope they never have to use. First aid kits, fire extinguishers, security alarms, smoke detectors and more could all help prevent a variety of accidents. While these products are safety staples everyone should own, many overlook the benefits or the need to test such objects. The last thing anyone wants is for a major safety precaution device to fail on them in the most inopportune moment. According to the United States Fire Administration, smoke detectors should undergo testing at least once month. Below are some steps to take to make sure a smoke detector is working. Many smoke detectors are still battery powered in one way or another. It’s very important to check the batteries monthly but the USFA recommends actually changing them out twice annually or as needed. A nifty way of remembering to change the batteries is to simply do so at daylight savings time. On the other hand, many smoke detectors are now powered by the electrical system of the home itself with backup batteries. While these devices are stable, it is worth following the same rule and replacing the backup battery as needed or twice annually. Many smoke detectors come with their own built in testing method. Some are simple as the touch of a “test” button. It is important to consult the manual of the device for further information regarding that. To begin with note that the testing the smoke detector can be unsettling, considering the loud, piercing noise that the device will emit. Before testing, if possible, keep a loved one in the room furthest from the smoke detector to ensure the device can be heard throughout the house. If it can’t be heard, this could mean adding another smoke detector or fixing a faulty one. In lieu of an instruction manual, most smoke detectors will have a test button. Simply long press this button. Take care to listen for a strong, piercing noise that is steady and consistently loud. If the sound “flickers”, sounds weak, or is otherwise interrupted, the batteries should be changed. Since these devices are often high up, it could be easy to overlook their basic maintenance. Dusting and clearing out the little vents should be done so that smoke could properly make its way into the detector and set off the alarm. Despite best efforts, products often fail as a result of faulty parts or manufacturing defects. When these products fail, the results could be devastating. 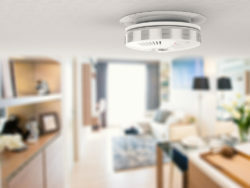 If you or a loved one has experienced injury or death or loss of property due to a faulty smoke detector, contact a product liability lawyer who could help. Contact the law offices of Richard Stoloff to schedule your initial case evaluation today.